William Faulkner suggested in his 1936 literary classic Absalom, Absalom! That “[Y]ears ago we in the South made our women into ladies. Then the War came and made the ladies into ghosts. So what else could we do, being gentleman, but listen to them being ghosts.”1 The existence of racial slavery in the South certainly shaped the relationships between men and women, white and black, influencing the contours of gender roles and expectations that prioritized mastery and White male privilege. Yet, despite Faulkner’s claims, voiced through Mr. Compson, Quentin’s father, in his parable of Southern history, that it was slave-holding men that “made” ladies out of their Southern women, the world of the slave-holding elite was not that static. Although patriarchy was fundamental to the racial order of Southern slaveholding, elite white women were not merely passive recipients of this system. 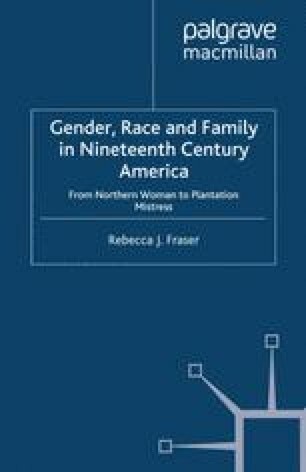 Recent scholars have brilliantly exemplified that wives and daughters of slaveholding men in the Old South were active agents in the shaping of their own sense of self throughout the antebellum period, albeit under the rubric of a Southern patriarchy that deemed white women, slaves and children, as inferior and thus dependents of white men. Southern white women who inhabited the world of the slaveholding elite accepted its fundamental principles of the prevailing racial and gender order, but also sought to retain some degree of power and presence in the lives of those they cared for — their family — and those that labored for them — their slaves.